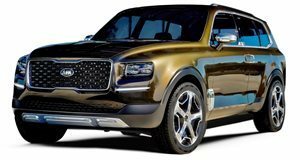 Set to be unveiled at the 2019 Detroit Auto Show three years after it arrived in Motor City in concept form, the 2020 Kia Telluride will be the Korean carmaker’s biggest and most luxurious model to date. Longer and wider than the seven-passenger Sorento, the Telluride comes with three rows and seating for eight passengers. The large SUV’s corporate cousin, the Hyundai Palisade, is powered by a 3.8-liter V6 rated at 291 hp and 262 lb-ft of torque mated to an eight speed automatic with optional all-wheel drive. Built at Kia’s manufacturing facility in Georgia, expect the Telluride to offer a similar powerplant and output when it starts rolling off the production line. Fortune favors the bold. This expression is derived from a Latin proverb, meaning Fortuna, the Goddess of luck, is more likely to help individuals who bravely go after what they desire. If this expression holds water, then a treasure trove of good luck should be coming Kia's way. Kia already sells a three-row SUV - the Sorrento - but with gas prices low and American buyers clamoring for bigger and bolder SUVs, the Korean automaker thought it best to capitalize with a new flagship SUV model. The Telluride arrives for the 2020 model year as the largest model in Kia's fleet. To discover what buyers should expect of the new car, Kia flew us out to Colorado to drive it across some excellent mountain roads and to visit the town responsible for the car's namesake. Before we arrived in Colorado, Kia took us to the town of Telluride to ask locals what they thought of its new SUV. Before being told what brand the car came from, more than a few people said it looked like a new Range Rover. We see plenty of Range Rover present in the Telluride's design, especially the name badge across the hood - though to be fair, the Ford Explorer copied this design detail first. 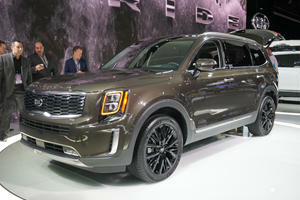 We love the rest of the Telluride's design and are glad Kia was able to keep it close to the original concept. The Telluride wears the widest iteration of Kia's 'Tiger Nose' grille, which has now become a staple of the entire lineup. On the tail side, Kia has given the Telluride reverse 'L' taillights, which add to the vehicle's wide stance. Even though this is a front-wheel-drive vehicle, it gives off a rugged vibe akin to a body-on-frame SUV. When other people see you on the road in the Telluride, they will see it as a premium vehicle. Only one engine is offered in the Telluride, a 3.8-liter V6 producing 291 horsepower and 262 lb-ft of torque. All Telluride trim levels are equipped with an eight-speed automatic sending power to the front wheels as standard or all four wheels for an additional $2,000. Kia has touted the Telluride's off-road performance but the AWD system only delivers up to 50% of the engine's power to the rear wheels on-demand, so we wouldn't want to use it to tackle the Rubicon. Power from the 3.8-liter V6 is smooth but in the high altitude of Colorado, we wished for more grunt. Kia says the twin-turbo V6 from the Stinger may be used in the future but we wouldn't hold our breath waiting for it. As with power, the fuel economy figures are average for the mid-size SUV segment. FWD models are rated at 20/26/23 mpg city/highway/combined while AWD-equipped models are more thirsty with ratings of 19/24/21 mpg city/highway/combined. If you plan to tow using the Telluride, Kia says it can pull up to 5,000 pounds. Although the Telluride's power or fuel efficiency numbers don't jump off the page, it dazzles once you step inside. This interior looks like it wouldn't be out of place in a luxury automobile. There are some hard plastic surfaces but they are minimal and don't look cheap. We liked the simulated wood material found on the SX trim, and even the buttons and knobs feel like quality items, giving off a premium vibe. The Telluride's gauges are clear and easy to read and the SX trim even includes a clever blind spot camera, which activates when you use either turn signal. Kia's infotainment system is housed on a simple touchscreen, which measures 10.25 inches on higher trim levels. We drove the fully-loaded SX trim, which also includes a surround-view camera, 10-speaker Harmon Kardon audio system and Kia's new Driver Talk system to speak to passengers in the rear seats using the car's speakers. Storage space is excellent in all three rows, so you'll never be lacking for a spot to hold your phone or drink. The Telluride offers up to six USB ports, two for each row, and there is an optional wireless charger in the front row. Kia cleverly integrated the second row USB ports into the front seats, making it easy to rest phones in the cup holders mounted on the back of the center console. We drove a seven-passenger Telluride with captain's chairs in the second row but an eight-passenger model with a bench seat is also available. The second-row seat even features heating and ventilation on the SX trim, which is rare even on far more expensive luxury SUVs - we just hopped out of a $100,000 BMW X7 that didn't have them. In either seating configuration, the seats fold flat and third-row access is incredibly easy with just a simple button press to slide the second row forward. Unlike the smaller Sorento, the third-row seat is usable even for taller adults and there is still a fair amount of storage with the third-row seats engaged. If you need the practicality of a full-size SUV, the Telluride is one of the largest in the mid-size segment. Kia says it offers more storage behind the third-row than a full-size Chevy Tahoe. With all three rows folded, the Telluride provides 87 cubic feet of storage. Flip up the second row, and there is still a whopping 46 cubic feet available. Even with the third row in place, the Telluride offers 21 cubic feet of storage and includes additional space in a cubby below the floor. Our time in the Telluride was limited to a spirited drive from our hotel in Gateway to the town of Telluride across Colorado's beautiful mountainous roads. Over the journey we experience snow, sleet, rain, and mud, testing the full range of the Telluride's abilities. We were impressed with how well the Telluride hustles around bends. You'd expect a heavy three-row SUV to lean through corners but the Telluride exhibits excellent body control even when we pushed it hard. Even over rough pavement, the Telluride retains a smooth ride, which will keep the entire family comfortable. This means if you are traveling up a mountain with the whole family in tow, you won't have to worry about any car-sick kiddos. Driving the Telluride is a pleasant experience, with light steering that can be made heavier if you switch to sport mode. We wouldn't call the Telluride as fun as the Mazda CX-9 but with its lighter steering in Comfort Mode, it is the mid-size SUV we would rather drive on a daily basis. If you do buy a Telluride, we suggest using Kia's Smart Mode, which can switch between Sport and Comfort on-demand. Our biggest gripe with the driving experience centered around the 3.8-liter V6. The eight-speed transmission shifts smoothly but we noticed the car having to heavily downshift in order to pass other vehicles. We'll chalk the Telluride's sluggishness up to the altitude, which is known to hurt normally aspirated engines. When we weren't aggressively trying to pass other vehicles, the Telluride is happy to cruise relatively quietly using its suite of advanced driver assistance features. All Telluride models come standard with adaptive cruise control and the EX trim adds an advanced Highway Driving Assist feature, which uses radar to detect lines and steer the car accordingly. Kia calls it Level 2 autonomy and the system works well on relatively straight roads. Even on curvy mountain roads, we are able to relinquish control to the car for a few seconds before it asked us to put our hands back on the wheel. We also tested the Telluride on a muddy off-road trail, where the limitations of the Michelin tires were highly apparent. Although Kia is selling this as an off-road-oriented SUV, the tricky trails are best left to the Wranglers and TRD Pro models of the world. As you'd expect from Kia, pricing for the Telluride is excellent for the segment. The base LX starts at $31,690 and includes seating for eight passengers, Forward Collision Avoidance, Lane Keep Assist, Bline Spot Detection, Blind Spot Avoidance, Rear Cross Traffic Avoidance, smart key with push-button start, Apple CarPlay and Android Auto, and leatherette upholstery. Stepping up to the S trim for $33,990 adds 20-inch wheels, heated front seats, and a power sunroof. We suggest opting for the EX trim for $37,090, which adds niceties like real leather seats with ventilation, the Highway Driving Assistant, 10.25-inch display with navigation, and a smart power liftgate. Kia gave us the top SX trim to drive, which starts at $41,490 and includes second-row captain's chairs, dual sunroofs, LED projector beam headlights, 20-inch black sport wheels, and a surround-view monitor. Our tester also included the SX Prestige Package for $2,000, which adds Nappa leather seats, a premium headliner, HUD, heated and ventilated second-row seats, heated steering wheel, and rain-sensing wipers. Our Dark Moss tester was optioned with everything except the $795 Towing Package, which would add a tow hitch and self-leveling rear suspesnsion. As-tested with some floor mats tossed in, the Telluride SX rang in at $46,840. We typically like to recommend restraint when optioning cars but we became enamored with the upmarket feel of the SX Prestige Package and wouldn't mind shelling out more for it. If you are on a budget, the EX trim offers a lot of the luxury found in the SX Prestige model for around $6,000 less. The Kia Telluride is far from faultless but its minor flaws don't detract from an obvious fact - this is one of the best three-row SUVs money can buy. If you are in the market for one of the countless three-row SUVs available today, including the Chevy Traverse, GMC Acadia, Dodge Durango, Honda Pilot, Hyundai Sante Fe, Mazda CX-9, Subaru Ascent, Toyota Highlander and Volkswagen Atlas, the Telluride needs to be on your radar. We think the Kia Telluride offers the best interior in the class and its driving dynamics are on par with many of the competitors we mentioned. Throw in Kia's 10-year/100,000-mile warranty and this Colorado mountain hauler comes out as a winner. The 2020 Kia Telluride earns a CarBuzz rank of Must Buy. 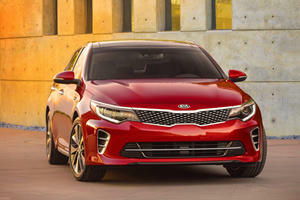 Kia embarks into all-new territory.